Peter Allen and Carole Bayer Sager wrote “No need to remember when, 'Cause everything old is new again.” Lately, that has become the Disney way: take a classic animated film and remake it into something that, although shiny and eye-popping in its live-action clarity, offers a strong dollop of nostalgia. As creatively dubious as the practice may be, it has offered the studio yet another reliable revenue stream. And, while Kenneth Branagh’s reinterpretation of Cinderella offered a glimpse at what these movies can be, most fall short of their hand-drawn inspirations. 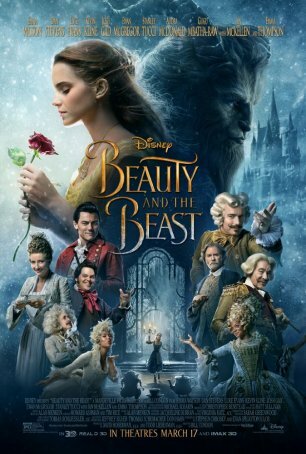 Such is the case with Bill Condon’s Beauty and the Beast, a lively, workmanlike musical that only occasionally rises to the heights of its 1991 predecessor and frequently coasts on a lower plane. Anyone who goes into the 2017 Beauty and the Beast with no knowledge of the earlier film will come away thinking it’s top-notch entertainment. To be sure, this is a good movie - there’s no denying that – but it suffers by comparison. Part of the magic of the 1991 production comes through the inventive animation. As good as the new iteration’s production design is (the only potential impediment to an Oscar nomination is the early-year release date), the intangible quality evident in Trousdale & Wise’s version is missing from Condon’s. There are times when Beauty and the Beast rises to the level of its predecessor but most of the time it feels like an inferior copy. Beauty and the Beast 2017 is a direct remake of the 1991 interpretation, which was notable for a number of reasons: it was the first animated film to be nominated for a Best Picture Oscar, it was the last full collaboration between lyricist Howard Ashman and composer Alan Menken, and it accelerated the renaissance of Disney animation begun in 1989 with The Little Mermaid. When a live-action remake was initially proposed, there was consideration of making it an adaptation of the Broadway musical but, by the time Condon was recruited, that idea had been scrapped. As a result, this Beauty and the Beast uses only the half-dozen songs from its predecessor. Three new compositions have been added (co-written by Menken and Tim Rice) but none of the material developed for the stage musical has been incorporated. For the most part, Condon has hewed close to the earlier version, at times seeming to use the animation as a template. Certain shots mimic those from the 1991 movie with exacting precision. (The most noticeable is probably Belle’s Sound of Music moment at the end of the reprise of “Belle”, but there are many others.) Some plot points have been changed in an attempt to provide additional background for Belle and the Beast. Most of these feel extraneous and do little more than compromise the economy of the original story. Neither the extended prologue with the enchantress nor the Paris-based scene add anything of substance. At 84 minutes, the first Beauty and the Beast was perfectly paced. The 45 minutes added to the 2017 production make it seem overlong and there are times when its energy flags. The new versions of the classic songs are presented with variable results. The best by far is “Be Our Guest”, which takes its cue from the original and engages in a deliciously over-the-top display of singing and dancing that offers an unparalleled visual spectacle as Ewan McGregor and Emma Thompson belt out the lyrics. “Belle” is beautifully choreographed and, although Emma Watson’s voice isn’t as pure as Paige O’Hara’s, she looks the part. “Gaston”, on the other hand, is something of a letdown. The number doesn’t seem as cheeky and mocking, and the additional lyrics (penned by Ashman but cut from the original) don’t add much. (The reprise is also missing.) “Beauty and the Beast” is also a disappointment in part because Emma Thompson’s voice doesn’t match Angela Lansbury’s and in part because the live action treatment of the film’s signature moment falls considerably short of the animated one. “Human Again,” which was added to Beauty and the Beast for the 2002 re-release, is not included. None of the new three tunes is likely to stick in the memory although “Evermore” (Menken/Rice) gives the Beast a spotlight song. It’s solid, although perhaps not as good as “If I Can’t Love Her” (also Menken/Rice) from the stage musical. Mimicking the 1991 movie, the narrative begins by showing how a vain, self-absorbed prince (Dan Stevens) is transformed into a hideous beast. The setting the jumps ahead to introduce us to Belle (Emma Watson), the most beautiful girl in a provincial town in France. Unfortunately for the preening, narcissistic Gaston (Luke Evans), who is obsessed with marrying Belle, she's also one of the village's oddest denizens. She keeps to herself, dotes on her father, Maurice (Kevin Kline), and devours books. Then, one fateful day, her father disappears in the forest while on the way to the market. Belle sets off in search of him and stumbles on a dark and scary castle. Venturing inside, she discovers a gallery of magical beings - regular household objects that speak and move. These include Lumiere (Ewan McGregor), a candlestick with impeccable manners and a voice that recalls Maurice Chevalier; Cogsworth (Ian McKellan), a mantle clock with a high impression of himself and his role in the castle; Mrs. Potts (Emma Thompson), a grandmotherly tea pot; and many others. Presiding over the crumbling manse is the Beast, who holds Maurice captive. Belle’s arrival fills him with equal parts hope and dread - hope that she might be "the one" to break the spell (allowing everyone in the castle to become human again) and dread that she might be repulsed by his ugliness. He agrees to release Maurice if Belle accedes to being his permanent “guest” – a bargain she accepts. Over time, Belle discovers that life in the castle is not as dreadful as it initially seems.